You guys remember Sailor Moon, right? Maybe the guys don’t–but every girl reading this blog should remember fantasizing about running around in those gorgeous outfits, fighting evil, winning love, and all that good stuff. When I was just a Little Kaye, I remember watching Sailor Moon religiously. I also have a vivid memory of walking into the video store with my mom and nearly having an aneurysm when I spotted a VHS copy of one of the Sailor Moon movies. Seriously, I freaked out. My happiness was complete. 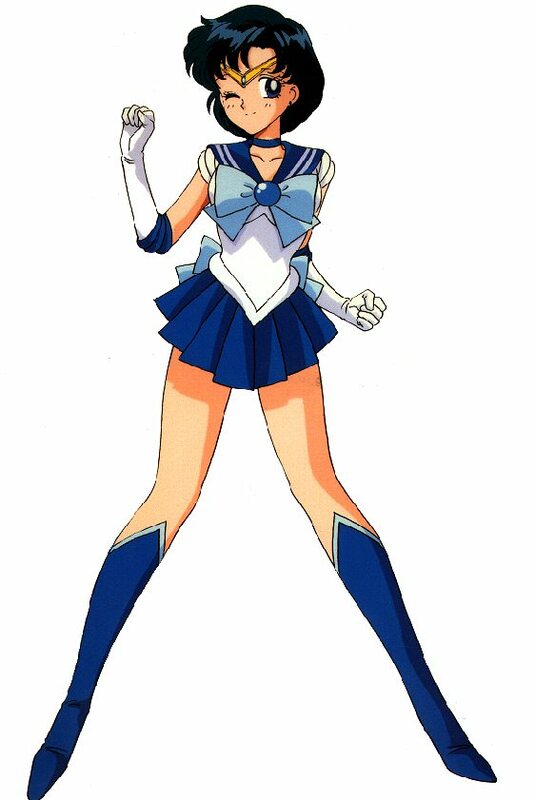 Back to Sailor Mercury. I loved her hair–not just the length, but also the color. I’ve long been fascinated with hair dye. My fondest wish has been to dye my hair blue, but due to a series of strange occurrences (which I’ll talk about in another post someday), I’ve had to settle for purple and red. I think I also connected with that character because she was very smart and bookish, much like me as a child. Aside from just being really fun, Sailor Moon was something little girls could watch on Saturday mornings that provided them with a group of really excellent female role models. The Sailor Scouts were so varied in their personalities–some were smart and bookish, some were more social creatures, some outgoing, some were shy, some were “girly girls,” some were more “tomboyish,” and so on. The message I took away from Sailor Moon is one that I think needs to come back in pop culture today: There’s no wrong way to be a girl! I remember running around in my room dancing to Power of Love “You've got to belieeeeeeeeeeve, in the POWAOFLOVE!”. My personally favorite was Makato/Lita but had the biggest nerd crush on Mamoru/Darien! 😛 This series was my childhood!